Testing SMTP functionality in applications can be a pain, especially when you don’t have access to an enterprise SMTP server. Even if you do have access to an SMTP server in your enterprise IT infrastructure, there’s the issue of antispam protection, Emails with zip files get marked as malware and don’t get to your inbox, the list goes on and on. 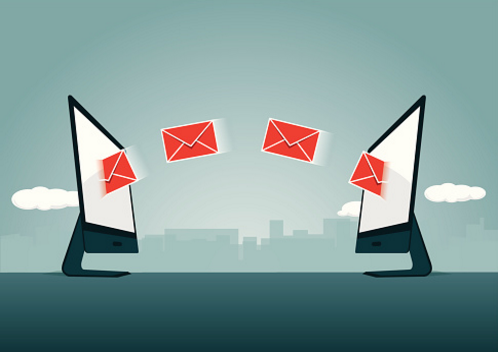 Here are 2 local SMTP applications that can emulate remote SMTP Servers, these two will save you the stress of installing an SMTP Server, or going through the trouble of configuring SMTP Services. Both applications emulate a remote SMTP server on your local machine, and Instead of actually sending the mail onwards like a normal SMTP server, they’ll simply catch the mail and notify you; saving you delay as you’ll receive the email instantly without the risk of it being caught in spam filters. Here’s a list of Pros that will help your decide which best suits your need when developing applications that send email via SMTP. Formatted Header View: The inspection view lists headers in a table for easier reading. View MIME parts: If your mail contains multiple mime parts, they can easily be seen separately in the inspection interface. More UI options: Enables you to delete all mails easily, has context menu options when right clicking the notification icon as well as generally more UI options than Papercut. Lots more options: It has vastly more options than Papercut. smtp4dev supports authentication, SSL and various other options, while Papercut only supports defining the listening port. 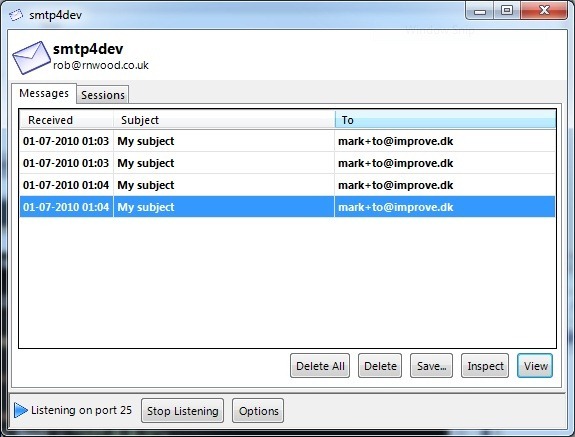 List of SMTP sessions: Using the sessions tab you can easily see how many SMTP sessions have occurred, as well as how many mails were sent as part of that session. Deployment: Simply just unzip the download and run the .exe right away, no installation, no configuration. Simplicity: Lacks some features, but when all you need is to quickly check the contents of a sent email, the simplicity of Papercut makes it extremely fast and easy to use. 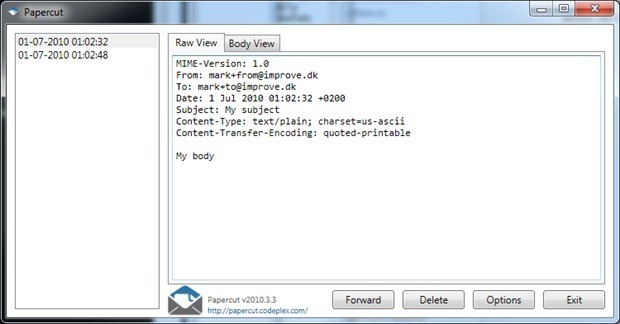 Direct HTML view: Unlike smtp4dev, Papercut will display HTML email contents directly in the interface without having to open the mail in Outlook. Forwarding option: It’s interface lets you forward the mail to a colleague right away, It’ll prompt you for an SMTP server to use – unfortunately it’s not possible to provide authentication credentials. This entry was posted on Monday, January 2nd, 2017 at 8:08 am	and is filed under Uncategorized. You can follow any responses to this entry through the RSS 2.0 feed. Both comments and pings are currently closed.